This place is an institution. Famous for its yum cha, it’s not to be confused with Shark Fin Inn, one of its sister restaurants just a bit further up Little Bourke Street. You need to go to Shark Fin House to get the whole experience – lining up at the door, shuffling inside with the crowd to get to the guy with the booking clipboard, cramming into the elevator – yes, the elevator – this place is THREE levels of dumpling heaven! This was a Sunday and it was Chinese New Year Sunday. People everywhere. The dragon and lion dances were on too, working their way slowly up and down Little Bourke and you know what that means – firecrackers (to drive away the evil spirits), and lots of them – so loud there was no option but to put your fingers in your ears or risk ear damage. Shark Fin House has their yum cha service running like a well-oiled machine – staff everywhere, trolleys, people with trays, men in black suits swanning around supervising and fixing the bills. With three lunch time sittings there’s a quick changeover required – as soon as people leave, their table is swooped upon by a couple of wait staff for a reset. Given all of the commotion, it’s a pretty noisy experience and you have to shout at eachother, but that’s all part of a great yum cha lunch – the hustle and bustle. Interestingly there were a few ‘standards’ that we didn’t see in our sitting – braised ox honeycomb tripe, for one (one of my favourites), nor were there any steamed pork spare ribs, ham soi gok, or wu gok – oh well, not to worry – we may have just missed them. Regardless, there were plenty of other things to enjoy, and I did get my tripe fix, albeit the ginger and shallot version. I always gauge the quality of yum cha by the siu mai (dim sims) and these didn’t disappoint. Great texture. The prawn dumplings were also good – nice chunky pieces of prawn. But the star of the day was definitely the deep fried squid tentacles. I have had a few tentacles in my time, but these are undoubtedly the best I’ve ever had! Large, juicy tentacles, perfectly cooked and seasoned. Not oily, and not battered like some. Quite a big serve too. 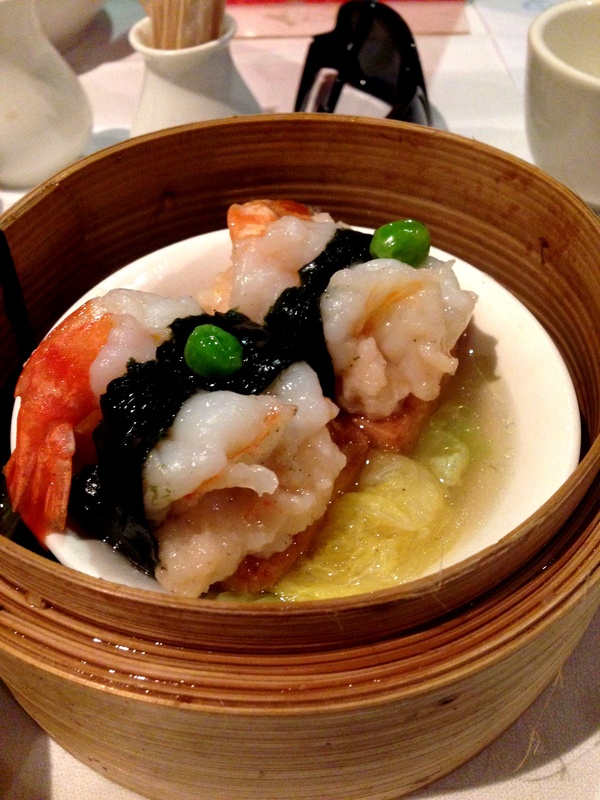 Oh, and Shark Fin House does so much more than yum cha – they also offer the full range of authentic Cantonese food with, of course, seafood live from the tanks – but to date, I’ve only enjoyed the yum cha. THE BEST squid tentacles ever! Nice. I agree; the elevator, clip board and wait in the sun/rain/wind/streetfights are all part of the experience of the ‘House’.